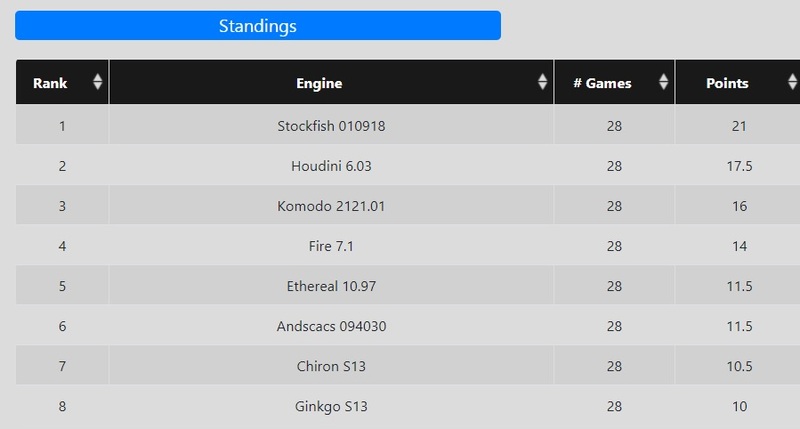 After two out of six double round robins, the international open source project Stockfish is dominating the Premier Division of the Top Chess Engine Championship. Stockfish has collected 21,0/28, with 14 wins and 14 draws. This leaves Stockfish 3,5 points ahead of competition and adds extra 71 ELO points for a performance close to 3600 ELO. The winner of TCEC S10 Houdini, playing with the same version as one year ago, is the closest competitor of Stockfish. So far they had four direct encounters and all of them finished draw. Houdini also drew all its matches with Fire and Ethereal, but has a solid 3,0/4 score against S7 and S8 winner Komodo, thus putting Houdini ahead in the race for the Superfinal qualification race. Komodo had a rough start and at a certain point even its third position seemed endangered by Fire and Ethereal, which both came at striking distance. Direct wins vs Fire in game 98 and Ethereal in game 107 put it back on track and Komodo is for now at a safe third place, with chances to go for second. The rising star of the season Ethereal, which stormed through Division 3, Division 2, and Division 1, is on a roller coaster in the Premier Division. It went from challenging the third position in the event to fighting for staying out of the relegation zone in just a few rounds. Currently it is sharing 5th-6th position with Andscacs, just a point ahead of Chiron and 1,5 points ahead of Ginkgo.